Style not Age - Dotty for Polka Dots. I can't believe how quickly this months challenge has come round! Yes it's the Style not Age monthly post and I'm in the driving seat. My brain has been working overload to find an interesting and topical prompt. ..... and so it appeared after running through a few web pages. Polka dots are spreading like measles spots, so why not join the party and invest in an item or two. I bought two tops for this challenge, but as soon as I put this outfit together I knew this was the one. My favourite look sort of fell into place. I already have a white with black polka dots blouse & a tunic dress that's black and white too, but wanted to bring a little colour to the party. I spotted (excuse the pun) my top in Zara, loving the colour I popped to the tills and bought it immediately. I had planned to wear it over my frayed cropped jeans, but whilst looking through my wardrobe, I pulled out my mustard culottes - to my surprise they looked perfect together. Which confirms the saying "it doesn't have to match, it just has to go" - actually a very liberating comment! Item marked with * have been gifted to me, however these are 100% my own honest comments. I have an on-going list of items that I need to complete outfits, I'm still hankering after black jeans, white or light denim cropped wide leg jeans & baseball trainers. One item I've already ticked off is a navy lightweight jacket. Bonmarche had the exact style I wanted so when I was recently asked to pick a few items from their new arrivals catalogue I had no qualms in selecting this fabulous PU Jacket* first. I'll be featuring this in the next couple of weeks along with the other items I chose, so I do hope you'll stop back to see another ladylike, feminine look. My cover-up fits very nicely into the outfit - navy is a much more flattering colour for mature ladies, complementing my mustard and yellow outfit superbly. Sleeves that finish on the elbow are great for spring and perfect for older arms, they've got just the right amount of coverage. These have a stylish smocking at the elbow with a tiny frill - very favourable for the over fifties. Here's a fun & interesting way to add colour and depth to your outfit. Adding a scarf tied around the handles bring together colours and textures to your look. You can read more about my bag that has matching shoe boots over on my Lotus Shoes post. I've echoed the polka dots with this beaded 3 strand necklace, this is an old necklace that works with my sophisticated outfit. Shall we see how Hilda, Emma and Anna from the Style not Age group have tackled this months challenge. Hilda found at Over the Hilda. has chosen a favourite back and white dotty dress with a pretty maroon peplum jumper over the top. We all have our fall-back garments the we love wearing, so much so I nearly wore mine ... which just so happens to be a black & white polka dot dress! Emma from Style Splash has chosen these super spotty trousers that have a perfect faint dot over them, paired with her cute collar jumper, wrapped up with her bright yellow coat. What a statement outfit she has, elegant and bang on trend for Spring. Anna from Anna's Island Style. As Anna has had a break recently, she's now back & normal blogging duties have resumed. As you can see her ability to match brilliant outfits have certainly not needed a holiday as her impeccable style is very much on form. Those boots really do bring the outfit to life & pull the look together for a rounded finish. Wow some interesting outfits being shared today. I hope we've inspired you to join the spotty brigade with an item or two, don't forget you can embrace the fashion without going the whole hog - add a polka dot scarf, bag or even an umbrella. Glad you stopped by today, thanks so much ladies. Until the next post, bye, bye it's been wonderful! Isn't the jacket great? I featured this a while back. I love this colour on you Jacqui, and the top and trousers look fabulous together! I love culottes on you! Well, I do like them on me too,lol. Great combination of colors! I love your colour combinations here - not one I would have considered myself, but really effective. Thanks for this style challenge Jacqui - I'm not big on spots but this top is a hit for me. Jacqui I love your colours ..great combo and accessorising. Love the polka dots on anything, Jacqui!! Such cute polka dot outfits. Love the yellow too! Such a beautiful blouse Jacqui. I love polka dots :) Thanks for sharing at Creative Mondays. I'm loving all shades of yellow right now. Love this pokedot top and you look fab wearing it. 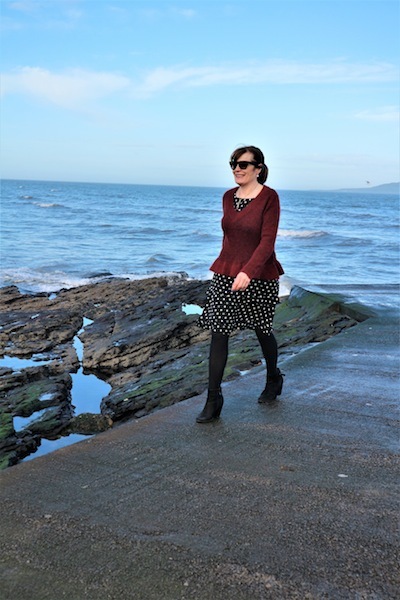 I'm a huge fan of polka dots so love all your outfit post! But I must say, that jacket you're wearing is stunning! Ahhh this is so cute. Yellow on a dreary day is everything! Your cropped pants are perfect! Such a pretty outfit! I love Polka dots for any outfit! The yellow is such a fun pop of color and I love how it brightens up your photos! I think your outfit is DIVINE, Jacqui!! And Anna's too, she's such an inspiration. A breath of Spring in those prettty pretty polka dots! I adore polka dots, great challenge! Your top is such a cool colour and goes well with the culottes. Ten out of ten! Oh wow, Jacqui! I love these colors and the polka dots and those amazing pants! Such a great outfit! That top is so cute! Polka dots are definitely becoming a huge trend and I love how you paired them with the yellow pants as well. A fun monochrome look! I adore the combination of the different shades of yellow and the blue accents. Gorgeous outfit! White with a Kimono & #chic&stylish Linkup. Style Steal - Pale blue and pink. What i wore with Jacquard trousers.